It may be a cliché, but it's still true: in order to understand where you're going, you must understand where you came from. This is the approach that writers Danzy Senna and W. Ralph Eubanks take in their new books, both of which explore their histories in order to arrive at the heart of their thoughts, feelings, and perspectives about race, identity, and family. You could call novelist Danzy Senna a walking dichotomy. In her nonfiction debut, "Where Did You Sleep Last Night?," she analyzes the sum of her parts: Her mother's side of the family hails from white Boston aristocracy where streets in the New England city bear their namesakes. Her father's side, however, isn't written about in history books. In fact, Carl Senna isn't completely sure who his father is; as a kid, he was shuffled between orphanages and extended family in the south. He managed to uproot himself, became one of Boston University's first black students and eventually an editor at Beacon Press. It was in this world that he met and married poet Fanny Howe in 1968, the year Martin Luther King, Jr. was killed. Together, Carl and Fanny thought they could beat the odds that said a union like theirs wouldn't last. It didn't. Their failed relationship left behind broken hearts and dreams, including their daughter's. When Senna was five years old, after her parents had been separated for some time, her father reappeared. She had already forgotten him. The confusion in her eyes prompted him to ask, "Don't you know who I am?" She shook her head no. It's this question that the bulk of "Where Did You Sleep Last Night?" seeks to answer. Senna treks to Alabama and Louisiana searching for clues to reconstruct her father's life before her. He travels with her for part of the journey to help as much as he can, although it's obvious that he isn't as interested in digging up the past as she. On her journey, she connects with family she has never met. More importantly, in experiencing the deep south from where her father emerged, she gains an appreciation for his path and character. There are hints of unaddressed bitterness surrounding her parent's failed marriage-particularly her father's role in it-and the lingering divisions within her family. Yet you appreciate Senna's openness about her conflicting feelings toward him, a man she loves but distances herself from, a man who physically abused her mother and who suffered from alcohol addiction. The book possesses a subtle urgency that gives you the sense that Senna had to write it. She had to unearth and untangle the complexities that helped produce who she is-a biracial woman-and how she views the world. There's also the feeling that it wasn't an easy book to write, to face some of the ugly realities that many families work hard to bury. But you're glad she took up the charge; you don't mind traveling with her-down south, through time and her mind, back and forth-especially when she employs the lyrical prowess that made her first novel "Caucasia" so well-received. 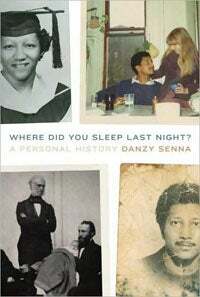 While questions about race and identity are heavily interwoven throughout "Where Did You Sleep Last Night?, " the book is foremost a family story where humanity, in all its paradoxical glory, is on full display. In the last pages of the book, Senna articulates this well: "In the end perhaps it is our errors, our failures, even more than our triumphs, that make us who we are." For W. Ralph Eubanks, however, it is the success of his grandparent's marriage that he's holding onto to help him navigate life, America and its racial waters. In "The House at the End of the Road," Eubanks, the author of a previous memoir, "Ever is a Long Time," returns to his grandparents' Alabama town in attempts to recreate their remarkable union. In 1914, James Richardson, a white man from a landowning family married Edna Howell, a light-skinned black woman. Together they built a house-both physically and emotional-at the end of a winding road where they raised their "mixed race" children, including Eubanks' mother, in the segregated South. For this reason, you want to know more about these daring individuals and how they made twenty years of marriage work in such turbulent times. You yearn to know intimate details about this white man who openly loved this black woman, and this black woman who openly loved this white man during a time in our country's history when interracial unions were outlawed. While Eubanks is able to uncover some details through interviews and historical documents, he's forced to rely heavily on inferences and his personal perspective to help characterize his grandparents. This is partly due to the lack of cooperation that Eubanks was confronted with when he reached out to some of his family members, particularly white Richardsons who weren't comfortable talking about race or acknowledging their black kin. His great-grandfather had two families-a black one from a mistress that he kept in secrecy, and a white one that mainly tried to ignore this truth. Subsequently, Eubanks was hit with the racial strife that can occur between blood relatives. He writes, "On both sides of my family, I have a grandparent with blond hair and blue eyes. If I had photographs of the two of them placed side by side, you could not tell which one was white and which one was black." It's this type of complexity regarding race and identity that permeates his thoughts and consequently, the book. Through his journey, he tries to sort out his own feelings of race. Even though he holds firmly to his identity of a black man, he feels it reflects an old-guard mind-set that may isolate him from broader racial perspectives. Through the prism of his grandparents' love in the face of racial unrest and their quest to ensure that their children could form an identity that wasn't based strictly on race, rather, one that was "true to themselves," Eubanks becomes determined to reshape his thinking about race. It's an act that he feels is vital for his interracial family-his wife is white and they have three children-so that he doesn't succumb to a one-drop racial philosophy. In the end, Eubanks feels that paying homage to his grandparents' union should include efforts to transcend race, a feat that he knows may not be completely possible. As he notes, "our cultural identities are what make us feel secure and safe." Nonetheless, he ends this part of his journey hopeful for a more open future. Although uncovering their histories required them to travel south, both Senna and Eubanks didn't have to go far to pinpoint commonalities between seemingly disparate parts of their families and their selves. Both books echo the truth that race and identity are far more complex than black and white. And that acceptance-of people for who they are, of the complex persons we all are-is difficult, but not impossible. Click here to hear Books on the Root's interview with W. Ralph Eubanks.